Funfurde: milky. way. chandelier. $112,000. 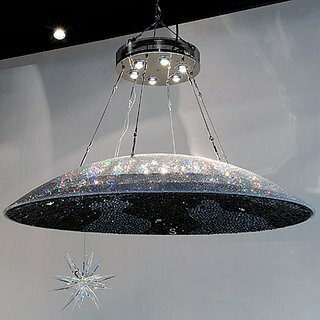 If you have $112,000 and you'd like a one-of-a-kind chandelier, check out the Milky Way by Andree Putman. This 450-pound monster features six halogen bulbs that illuminate a fiberglass dome covered by a crystal studded fabric, thus achieving its night sky effect. Those are Swarovski crystals it's covered in by the way, including one big fat one that dangles below the main body, which I'm presuming may represent the sun (but really I'm just guessing on that one). The Milky Way is slightly over 4 feet high and 6.5 feet wide, making it just about as big as our own galaxy. Shame, I'll have to find something else to do with that $112,000!